The world’s easiest fishfinder, HOOK² 4x Bullet offers simple menus, easy access to key functions and Autotuning sonar. 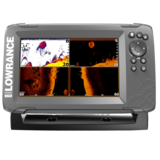 Powered by proven Lowrance® performance, HOOK² 4x features wide-angle, Broadband sonar coverage, plus a simple and accurate GPS Plotter. Just plug it in and fish. Yes, it's that easy. Save waypoints, follow trails and navigate to your favorite fishing spot with the simple and accurate GPS Plotter built into the HOOK² 4x GPS Bullet display. Anglers will cover more water in less time with proven HOOK² Bullet wide-angle, Broadband sonar, offering double the sonar coverage of most fish finders. You will be free to focus on fishing with Autotuning sonar, a new feature that actively adjusts sonar settings as fishing conditions change. You just fish and let HOOK² do the rest. The world’s easiest fishfinder, HOOK² 4x offers simple menus, easy access to key functions and Autotuning sonar. 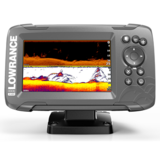 Powered by proven Lowrance® performance, HOOK² 4x features wide-angle, Broadband sonar coverage. Just plug it in and fish. Yes, it's that easy. You will be free to focus on fishing with Autotuning sonar, a new feature that actively adjusts sonar settings as fishing conditions change. You just fish and let HOOK² do the rest. The All Season Package includes carrying case, 12 V battery with a charger, wide-angle 200 kHz transmitter with the cable and suction cup attaching capability and 2 boxes. The world’s easiest fishfinder, HOOK² 4x Bullet offers simple menus, easy access to key functions and Autotuning sonar. Powered by proven Lowrance® performance, HOOK² 4x features wide-angle, Broadband sonar coverage, plus a simple and accurate GPS Plotter. Just plug it in and fish. Yes, it's that easy. Save waypoints, follow trails and navigate to your favorite fishing spot with the simple and accurate GPS Plotter built into the HOOK² 4x GPS Bullet display. Anglers will cover more water in less time with proven HOOK² Bullet wide-angle, Broadband sonar, offering double the sonar coverage of most fish finders. You will be free to focus on fishing with Autotuning sonar, a new feature that actively adjusts sonar settings as fishing conditions change. You just fish and let HOOK² do the rest. The All Season Package includes carrying case, 12 V battery with a charger, wide-angle 200kHz transmitter with the cable and suction cup attaching capability and 2 boxes. The Lowrance's most easily configured fishfinder/chartplotter HOOK2-5 Splitshot has a simple menu and automatic sonar settings. The split sensor provides a wide angle view of the High CHIRP and Downscan Sonar. The autotuning sonar automatically makes the sonar image quality higher, so there is no need to manually adjust the settings. However, it is also possible to change the settings manually. Convenient to use - a simple menu and a handy push-button. MicroSD card slot allows you to save waypoints and routes. Map options - ALTER2, C-MAP, Navionics. The world’s easiest fishfinder, HOOK² 7x SplitShot offers simple menus, easy access to key functions and Autotuning sonar. 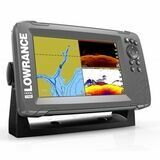 Powered by proven Lowrance® performance, HOOK² 7x features SplitShot 2-in-1 sonar with wide-angle, Broadband coverage and DownScan Imaging™, plus a simple and accurate GPS plotter. Just plug it in and fish. Yes, it's that easy. You will be free to focus on fishing with Autotuning sonar, a new feature that actively adjusts sonar settings as fishing conditions change. You just fish and let HOOK² take care of sonar performance – performance powered by SplitShot 2-in-1 sonar. Save waypoints, follow trails and navigate to your favorite fishing spot with the simple and accurate GPS Plotter built into HOOK² 7x SplitShot. The world’s easiest fishfinder/chartplotter, HOOK² 7 SplitShot offers simple menus, easy access to key functions and Autotuning sonar. 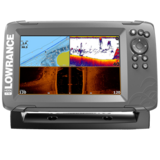 Powered by proven Lowrance® performance, HOOK² 7 features SplitShot 2-in-1 sonar with wide-angle, Broadband coverage and DownScan Imaging™, plus a simple and accurate GPS plotter. Just plug it in and fish. Yes, it's that easy. You will be free to focus on fishing with Autotuning sonar, a new feature that actively adjusts sonar settings as fishing conditions change. You just fish and let HOOK² take care of sonar performance – performance powered by SplitShot 2-in-1 sonar. Save waypoints, follow trails and navigate to your favorite fishing spot with the simple and accurate GPS Plotter built into HOOK² 7 SplitShot. 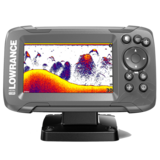 The Lowrance's most easily configured fishfinder/chartplotter HOOK2-7 Tripleshot has a simple menu and automatic sonar settings. Tripleshot sensor provides a wide angle view of the High CHIRP, Sidescan and Downscan Sonar. The autotuning sonar automatically makes the sonar image quality higher, so there is no need to manually adjust the settings. However, it is also possible to change the settings manually. Convenient to use - a simple menu and a handy push-button. MicroSD card slot allows you to save waypoints and routes. Map options - ALTER2, C-MAP, Navionics. The Lowrance's most easily configured fishfinder/chartplotter HOOK2-9 Tripleshot has a simple menu and automatic sonar settings. Tripleshot sensor provides a wide angle view of the High CHIRP, Sidescan and Downscan Sonar. The autotuning sonar automatically makes the sonar image quality higher, so there is no need to manually adjust the settings. However, it is also possible to change the settings manually. Convenient to use - a simple menu and a handy push-button. MicroSD card slot allows you to save waypoints and routes. Map options - ALTER2, C-MAP, Navionics. The Lowrance's most easily configured fishfinder/chartplotter HOOK2-12 Tripleshot has a simple menu and automatic sonar settings. Tripleshot sensor provides a wide angle view of the High CHIRP, Sidescan and Downscan Sonar. The autotuning sonar automatically makes the sonar image quality higher, so there is no need to manually adjust the settings. However, it is also possible to change the settings manually. Convenient to use - a simple menu and a handy push-button. MicroSD card slot allows you to save waypoints and routes. Map options - ALTER2, C-MAP, Navionics. The compact HDS-7 Live includes all the latest Lowrance Fishfinder features with support for Active Imaging™, LiveSight™ real-time sonar, StructureScan® 3D and Genesis Live mapping. Not supplied with Active Imaging 3-in-1 transducer. The Solix 12 CHIRP MEGA SI GPS combines tournament-ready technologies like CHIRP Digital Sonar and AutoChartⓇLive with intuitive Cross TouchⓇ, BluetoothⓇnetworking and the new HumminbirdⓇBasemap. Up to four independent viewing panes allow you to view multiple technologies at once, taking full advantage of the generous 12.1" display. This model offers MEGA Side Imaging and MEGA Down ImagingⓇfor an unrivaled view of the underwater world. MEGA Imaging: Unprecedented under water clarity of coverage out to 125 feet on either side of and below your boat. You'll unlock new details with up to 3X more output than standard Side Imaging Sonar. CHIRP Digital Sonar: View details that other forms of sonar won't show you. 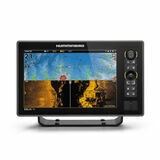 Humminbird CHIRP Digital Sonar is engineered to help you see individual fish, clearly identify bait and structure, and reach greater depths and range. Simrad GO7 XSR Multi-touch screen Combo drive. GO7 has built-in Wi-Fi. Device has also CHIRP and StuctureScan sonarfunction. Suited for boat owners whose interests are fishing, water sports or just cruise. The compact device is ideal for small vessels, with little console space. 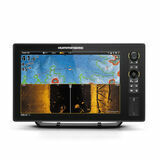 Simrad GO7 XSR 7 " Multi-touch screen Combo drive, comes with a new TotalScan™ sensor (CHIRP medium / high 455 / 800). GO5 has built-in Wi-Fi. Device has also CHIRP and StuctureScan sonarfunction. Suited for boat owners whose interests are fishing, water sports or just cruise. The compact device is ideal for small vessels, with little console space. Simrad GO7 XSR 7 " Multi-touch screen Combo drive, comes with a HDI sensor (CHIRP medium / high 455 / 800). GO7 has built-in Wi-Fi. Device has also CHIRP and StuctureScan sonarfunction. 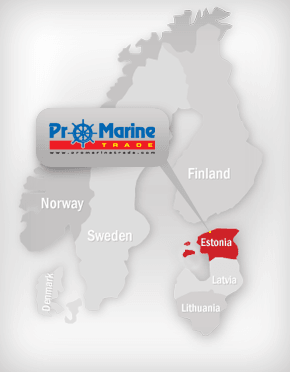 Suited for boat owners whose interests are fishing, water sports or just cruise. The compact device is ideal for small vessels, with little console space. Wireless Black Box Sonar for Smartphones and Tablets. Transform your smartphone into a powerful CHIRP DownVision sonar with Wi-Fish™. Simply download the free Wi-Fish app and connect using standard Wi-Fi and you will be streaming real time sonar right to your phone or tablet. The Wi-Fish mobile app puts Dragonfly sonar vision right in the palm of your hand, plus you can rewind and capture sonar images to share online with friends. Superior Fishing Electronics Made Incredibly Simple By Raymarine: Change your underwater view and catch more fish with the Dragonfly 4 wide-spectrum CHIRP DownVision™ technology. Easily identify fish and underwater objects with photo-like sonar images. Dragonfly’s all-weather, high-definition color LCD display looks sharp from every angle. Step up to a smarter species of sonar with Dragonfly. The Dragonfly Difference: A leap into the future of sonar, Dragonfly sonars employ true wide spectrum CHIRP technology. With wide spectrum CHIRP more sonar signals are transmitted into the water, allowing Dragonfly to interpret more detail, target more fish, and image structure with unmatched clarity. Dragonfly 4 PRO with GPS built in give you the choice of Navionics, C-MAP by Jeppesen or Raymarine LightHouse compatible charts. 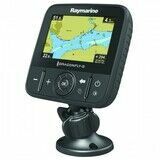 Raymarine Dragonfly 5 M is 5-inch Colour Chart Plotter With GPS The Best Maps Dragonfly models with GPS built in give you the choice of Navionics, C-MAP by Jeppesen or Raymarine LightHouse compatible charts. A Better View Each Dragonfly is engineered with optical bonding LCD display technology. Once only available on high end marine displays, Dragonfly’s all weather optically bonded displays deliver brighter colors, sharper contrast, and are guaranteed to never fog up. Mount Anywhere The Dragonfly 4 and 5’s compact ball-and-socket mounting system makes installation simple. The mount is easy to upgrade to after market ball-and-socket mounting systems. Superior Fishing Electronics Made Incredibly Simple By Raymarine: Change your underwater view and catch more fish with the Dragonfly 5 wide-spectrum CHIRP DownVision™ technology. Easily identify fish and underwater objects with photo-like sonar images. Dragonfly’s all-weather, high-definition color LCD display looks sharp from every angle. Step up to a smarter species of sonar with Dragonfly. The Dragonfly Difference: A leap into the future of sonar, Dragonfly sonars employ true wide spectrum CHIRP technology. With wide spectrum CHIRP more sonar signals are transmitted into the water, allowing Dragonfly to interpret more detail, target more fish, and image structure with unmatched clarity. Dragonfly 5 DVS has dual channel CHIRP sonar with Downvision. Superior Fishing Electronics Made Incredibly Simple By Raymarine: Change your underwater view and catch more fish with the Dragonfly 5 wide-spectrum CHIRP DownVision™ technology. Easily identify fish and underwater objects with photo-like sonar images. Dragonfly’s all-weather, high-definition color LCD display looks sharp from every angle. Step up to a smarter species of sonar with Dragonfly. The Dragonfly Difference: A leap into the future of sonar, Dragonfly sonars employ true wide spectrum CHIRP technology. With wide spectrum CHIRP more sonar signals are transmitted into the water, allowing Dragonfly to interpret more detail, target more fish, and image structure with unmatched clarity. Dragonfly 5 PRO with GPS built in give you the choice of Navionics, C-MAP by Jeppesen or Raymarine LightHouse compatible charts.